While this macro-mineral is easily obtained from many foods, magnesium deficiencies are extremely common for many Americans. Alcohol consumption, the presence of fluoride, and the consumption of certain foods either increase our need for magnesium, or decrease its absorption. Magnesium is not only one of the key nutrients required in both calcium utilization and protein synthesis, but it also plays a tremendous role in virtually every enzymatic reaction in our body. 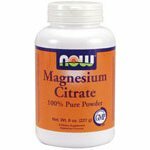 NOW Magnesium Citrate Vcaps are fast acting, safe and ideal for anyone who has their sights set on attaining optimal levels of this vital nutrient.